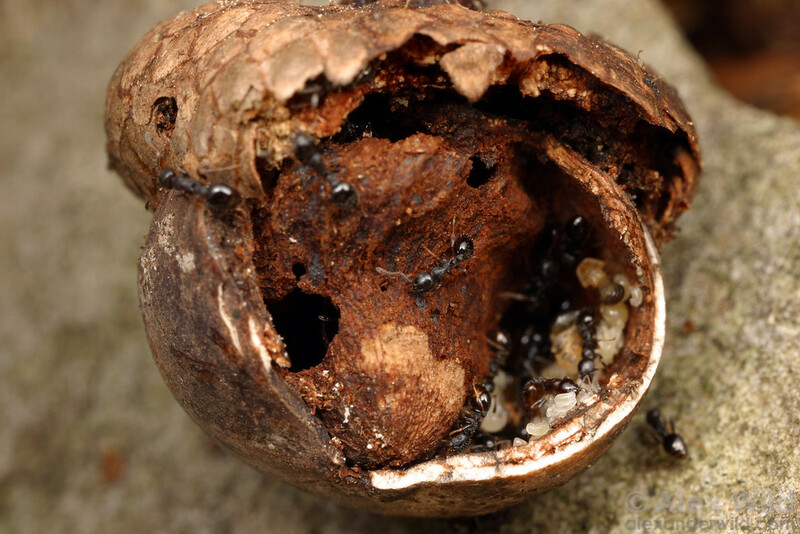 Slave-making (also called slave-raiding) in ants occurs when ants leave their nest, enter the nest of another species of ant, steal the developing larvae and/or pupae, bring them back to their own nest, and then rear the captured young into adult workers. Slave-making is a type of social parasitism, meaning that the slave-making ants are benefiting at the expense of the host, or captured, species of ant. This relationship can either be facultative, meaning that the slave-making ant can survive without taking brood from another colony (though they may not be as productive without slave-making), or the relationship can be obligate, meaning that the slave-making ants are unable to survive, usually because they cannot eat or care for their own young, without help from the host. Due to the anthropomorphic and potentially offensive nature of the terminology surrounding slave-raiding ants and their behaviors (Herbers 2007), I will use either the term “parasitic” or the myrmecological term “cleptergic” to refer to slave-making ants, and the term “host” to refer to the captured ants. While this relationship is not common (only about 60 species of cleptergic ants are known), many fascinating adaptations have occurred to defend against this behavior. In some species, researchers have noticed that host ants, upon seeing parasitic ants out scouting for colonies to raid, will attack or bite the parasitic ants, which can be an effective defense against brood-theft (Foitzik et al. 2001). But how could this complex recognition and subsequent attack evolve? It is likely that there was already variation in host ant aggression, and ants that were more aggressive were more likely to successfully defend raids. Colonies that could defend against raiding would keep a larger workforce and be able to put more effort into raising more “queen” ants, which could go out and start their own colonies. Over time, the more aggressive ants could increase in numbers, while the less aggressive ants, more susceptible to loss of brood by parasitic ants, would not be able to produce as many new queens, and would dwindle in numbers. This hypothesis is supported by the observations that in locations where host ants encounter many parasitic ants, host ants are more aggressive on average than host ants that live in places that do not have many parasitic ants (Foitzik et al. 2001). Initially, it was assumed that the captured young, once matured, were unaware that they were living with the “enemy”, and worked earnestly in favor of the cleptergic colony. It was discovered that the newly emerged brood recognize the parasite’s nest as their own through olfactory learning (Le Moli and Mori 1985), similar to how hand-reared baby chicks recognize their human caretakers as their parents. Observations of host ants helping their captors go on raids and steal brood from other colonies, sometimes even the same colony that they were taken from, suggested that host ants were unaware of their situation. 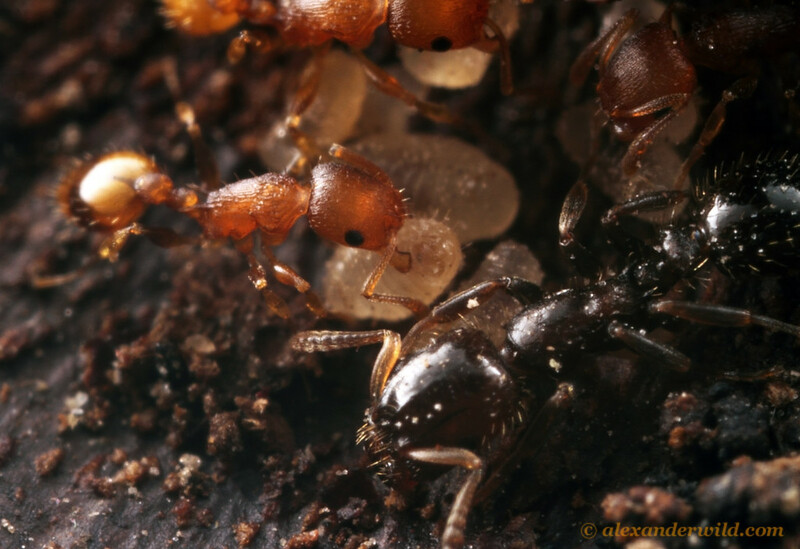 Host Temnothorax curvispinosus (light brown) cares for brood under watch of Temnothorax americanus (dark brown) . Photo taken by Alex Wild, for more information and photos, see his page at alexanderwild.com. However, there is a growing body of evidence suggesting that the hosts are not always so oblivious to their origins, as researchers observe more and more situations of what they are calling “slave (host) rebellion”. Czechowski and Godzinska, in their recent review article, “Enslaved ants: not as helpless as they were thought to be”, identify four types of rebelling behaviors, which range from aggressive acts by individual ants to a collective uprising against the parasites. Polyergus mexicanus (left) with its host, Formica argentea (right). Alex Wild points out in the caption of his photo that the mandibles of P. mexicanus have a row of tines, which helps the social parasite carry brood, whereas F. argentea mandibles are strong, working mandibles. Photo taken by Alex Wild, for more information and photos, see his page at alexanderwild.com. 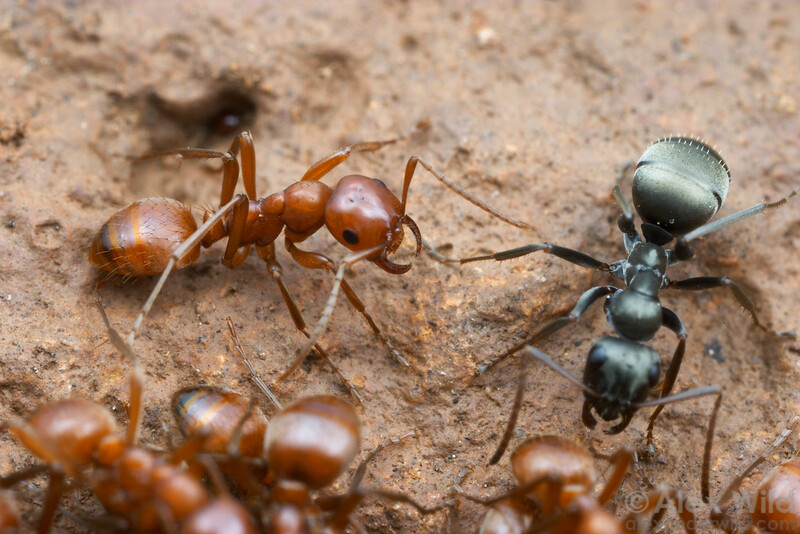 The first rebelling behavior is categorized as “domestic misunderstandings”, and occurs when the hosts show aggression toward the parasitic ants. Typically these altercations do not lead to any serious harm, just a little leg and antennae pulling, and do not lead to a revolt. Another fascinating behavior called “host reproduction” describes the situation when the host ants lay their own eggs in the parasitic colony, sometimes even adding them to the pile of eggs that the cleptergic queen is guarding. Ants reproduce via haplodiploidy, which means that males are produced asexually and female offspring are produced sexually via the fusion of gametes. This means that the host workers can produce male, but not female, offspring. “Sabotage” describes the situation in which hosts kill off the brood of the parasites instead of caring for them. Ant ecologist Dr. James Trager notes in the blog Minute Myrmecology that he has observed mixed colonies that coexist for many years in the field, however, when brought back to the lab, the host ants will not raise the parasite’s brood and will kill the parasitic workers, suggesting that captive conditions are not conducive to the persistence of host-parasite mixed colonies. Because all instances of observed sabotage have occurred under laboratory settings, it is difficult to know whether or not this plays a role in wild colonies, and further research is needed to understand the mechanisms and significance of sabotage behavior. Finally, “host self-liberation” has been observed in 2 host species, and occurs when the host ants “take over” the nest of the parasitic ant, by killing off the parasitic brood and/or replacing the parasitic queen with a host queen. Curiously, all instances of host liberation were noted from field experiments, suggesting that host emancipation is not an artifact of captivity, but rather may be an evolutionary response to cleptergy. Briefly, they hypothesize that ant colonies that are near each other are more closely related to one another, so when the hosts rebel by killing the brood and workers of the cleptergic ants, it reduces parasitism pressure on the nearby colonies, allowing them to survive longer and produce more brood and queens. Because they are closely related, it is thought that the rebellion behavior is shared, allowing the evolution of rebellion. Temnothorax longispinosus colony inside an acorn (ants from the “Why do slave ants kill slavemakers?” video by the Foitzik lab linked above). Photo taken by Alex Wild, for more information and photos, see his page at alexanderwild.com. In the future, more studies on why rebellion is common in laboratory settings but not necessarily in field settings may help researchers better mimic natural conditions in the lab, allowing for more accurate observations of these fascinating host-parasite interactions. This would allow researchers to answer some really interesting questions, such as what causes hosts to revolt? Is there a cue, or what mechanism triggers revolting behavior? How soon, if ever, do the hosts recognize that they are not in their own nest? There is a fascinating and diverse array of social interactions outside of human culture, which are easy to overlook when we’re too busy trying to keep the ants out of the cupboards. Next time you find yourself bothered by a few of those pesky foragers, take a minute to see what they’re up to—you might find just find their behavior endearing! Czechowski, W., and E. J. Godzińska. 2015. Enslaved ants: not as helpless as they were thought to be. Insectes Sociaux 62:9-22. Foitzik, S., C. J. DeHeer, D. N. Hunjan, and J. M. Herbers. 2001. Coevolution in host-parasite systems: behavioural strategies of slave-making ants and their hosts. Proceedings of the Royal Society of London: Biological Sciences 268:1139-1146. Herbers, J. M. 2007. Watch your language! Racially loaded metaphors in scientific research. BioScience 57:104-105. Le Moli, F. and A. Mori. 1985. The influence of the early experience of worker ants on enslavement. Animal Behavior 33:1384-1387. Myrmecos, Minute Myrmecology: Why do slave ants kill slavemakers? Alex Wild, March 26, 2013. Next PostNext Going gaga for ferns!